A while back, I was invited to Hotel Indigo with a few other local bloggers to sample their restaurant’s menu, and they brought out this salad that had me absolutely smitten. It had spinach, local strawberries, feta cheese and pecans tossed in a strawberry vinaigrette. It was DIVINE. I knew one day I’d have to remake this for when we had company, and I actually made this a while ago. Like…Easter. I took pictures of this salad back in April and completely forgot about it. Oops! Easter is smack dab in the middle of our strawberry season here, so I knew that this would be the perfect occasion to make this salad. It was ridiculously easy to throw together, and the salad was a hit. It tasted pretty darn close to the salad I enjoyed at the hotel, and I was thrilled about that. In fact, since I made this salad in April, I’ve made this vinaigrette multiple times. It’s just that good, y’all. I haven’t made the salad in quite a while, though, since I’m a strawberry snob and the season is long gone. 🙁 I envy those of you who still have fresh strawberries at your local fruit stands! To make the vinaigrette, place the strawberry jam in a large bowl and whisk in the vinegar until everything is well-mixed. Keep whisking the mixture and slowly add in the olive oil. Whisk until the dressing doesn’t look like it’s separating. Season the dressing with salt and pepper. 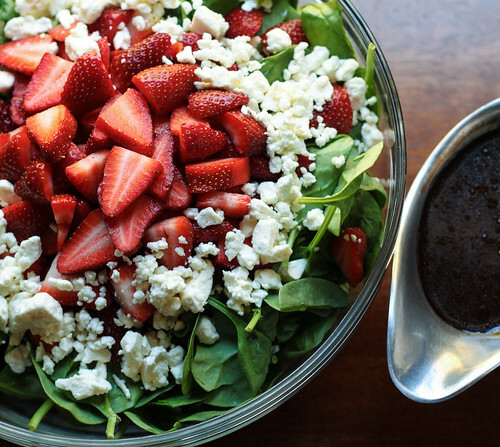 Add the spinach, strawberries, feta cheese and pecans to the bowl and toss the ingredients together until everything is coated with the dressing. Serve immediately, or if you’re serving at a later time, just make the dressing separately and serve it on the side (make some extra dressing, just in case you have some dressing lovers) instead of tossing it with the salad ingredients. I can see why you were smitten with this salad. It’s so pretty and the flavors sound amazing! I’ve never thought of using jam to make dressing. Sorry about the caps..auto correct keeps adding them.. So glad you enjoyed it!! Thank you for reading! About how many does this serve would you say? Thank you so much for sharing this recipe! I tried it today, and it was so delicious! Had this salad @ my cousins home in San Jose was so very good! My family throughly enjoyed it! Made it tonight with my granddaughter another hit! We will have it again tomorrow night! When I return home (Hawaii) will make it again for my family and for “potluck” with friends! Thank you so very much!! !